This fabric chair is designed with angled armrests and chrome legs that deliver a soft modern aesthetic that is visually stunning yet versatile enough to go into any living room. Wide arms, supportive cushions, and upholstered in a soft fabric, this chair is a product of thoughtful, uncompromising design. The removable backrest allows this chair to be easily moved through door frames. Amazing and affordable style arrive in the form of this New Addition to the Wall St. Collection. Constructed of High Performance Easy-Care upholstery, this faux Leather Club Chair is alluringly designed with a contemporary edge. This design savvy furnishing features a box spring that provides for solid structural support and comfort, overlay button details for added interest, and a sleek chrome finished square edged metal base for a modern aesthetic and additional durability. Masterfully constructed of high quality upholstery, this chair is the perfect addition to any home or office that begs for a fresh and updated look. Style your home with these contemporary accent chairs from the CorLiving Collection. Add an aura of sophistication to your decor with a pair of LAD-460-C chairs. Featuring a diamond tufted back and beige polyester woven fabric, these uniquely contoured and foam filled chairs are easy to vacuum clean and will provide years of comfort. The sturdy wooden frame is completed with Dark Espresso stain and gently flared wooden legs giving a contemporary nod to a classic design. Easy to accent any living space or make a bold statement placed around a dining table. With an eye-catching contemporary design, this barrel chair features a chrome base and glossy white frame guaranteed to turn heads. The unique shape envelopes the sitter, creating a cozy spot for you and your guests in your living room. With a sturdy pedestal base and a smooth swivel seat, this barrel chair is perfect for those looking to make a statement in their home. With an eye-catching semi circular design, this chair features a chrome base and glossy white frame guaranteed to turn heads. The unique shape envelopes the sitter, creating a cozy spot for you and your guests in your living room. With a sturdy pedestal base and a smooth swivel seat, this chair is perfect for those looking to make a statement in their home. 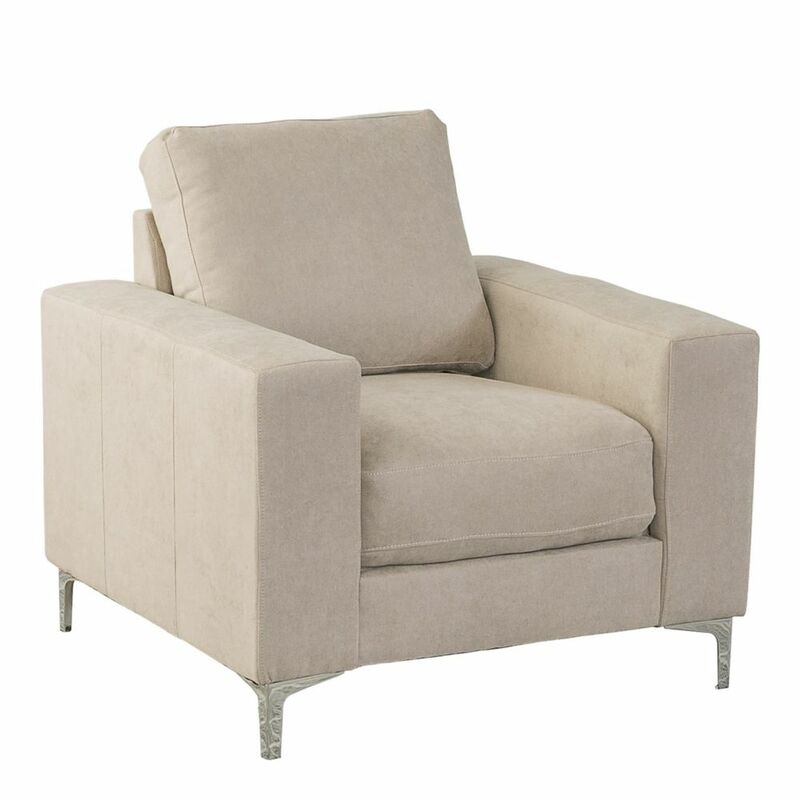 Cory Beige Chenille Fabric Armchair This fabric chair is designed with angled armrests and chrome legs that deliver a soft modern aesthetic that is visually stunning yet versatile enough to go into any living room. Wide arms, supportive cushions, and upholstered in a soft fabric, this chair is a product of thoughtful, uncompromising design. The removable backrest allows this chair to be easily moved through door frames.